The 348 was later enlarged to 409 cubic inches. In which the Beach Boys sang " My four speed, dual quad, Posi-Traction 409"
Didn't the 409 come stock with 2 4bbl carbs ? Never saw one myself, standard was the column shift 3 speed. Got me thinking and had to look it up, looks like in 63 the powerglide was available with the 340 horse 409. In 64 the 409 option was a mandatory 4 speed. Stock was single 4bbl carb, 360HP. Clarity is the biggest improvement with ample bass (two 15" speakers) and a sweet mid range. First reflection is no longer a problem in that sound to the sides is largely self cancelling. The listening sweet spot is larger, not confined to one seat in the room and sound is not beamed at you like a boxed speaker often does but seems to radiate forward in a hologram.....hence the name. I have tried powering them with the tubed horn monos and the mids are luscious and with the ATI 1502 the bass has more slam and seems more cohesive and tight. I am using the tubed preamp with the SS ATI though so tubes are in the chain. Bottom line is I love them. They will be first string for the foreseeable future. Damn it to hell...I don't understand this on the below model....Impedance: 12 Ω average on this model. I'm playing through a Mac Mini to a Wyred4sound DAC, to a pair of Wyred4Sound mAmps...Will the below work? 60 day trial period allows you to experience the M3 in your own home without risk. Available in Black, Red and White Satin. Lead time for new orders approx 1 week. 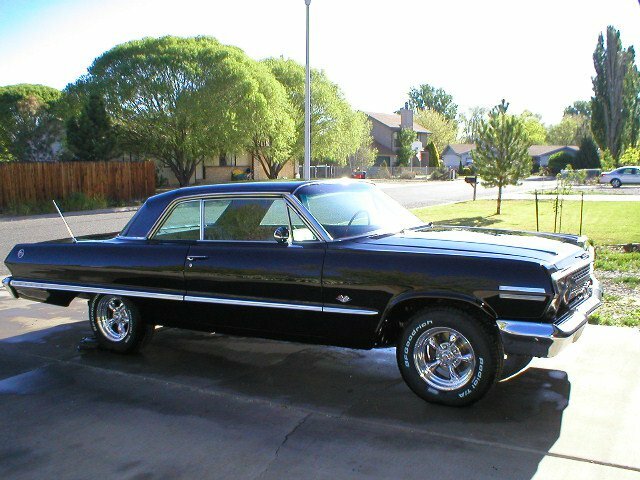 My father had a 64 Impala SS, Black with hubcaps, 400 horse, 456 gear 409. Always spoke of racing with his buddies and pissed about the Hemi's passing him in the last 50 feet of the 1/4 mile. The dual quad was faster but only if you tinkered with it constantly to keep it in tune. Just wondering, my dad had one with 2 carbs, he may had done that himself. Was it a 1962 or later model year 409? SNIP From Hemmings Motor News: 'With an instant reputation, there was no question that the 409 would come back, and when it did, there would be no more mistakes. For '62, Chevy again made the 409 available in any full-sized car; the block was re-engineered, with reinforced webs for the main bearings. GM continued to develop the head, with intake valves 0.13-inch larger at 2.203. A cam with 85 degrees of overlap was unchanged, but valve springs were now stouter to address the breaking problem, rated at 320 pounds of tension open, up from 280. The engines retained forged aluminum pistons, but now they were tin-plated, and the old solid skirts were replaced with slipper skirts to control clattering. Their heads were now milled to clear the big valves, meaning there were two different pistons in each engine: one set for cylinders 1, 4, 5 and 8, and one for numbers 2, 3, 6 and 7. A new oil pump also increased pressure to 75 PSI from 40. We have to like this guy ! @ The 13 minute mark... Has a pair of la scalas and some mac gear ..
2 4bbl carb 409 was an option for 62,63 & 64. I have no idea, it was just an engine in the shop he and my uncle had, I was pretty young. It was an aircraft repair shop, small planes, and helicopters and when things were slow they built frames for dragsters. This was so long ago it was when you sat behind the engine with your legs around the bellhousing pretty much. He kept this engine for years for some reason, he asked me later if I wanted it. I was very young and was playing with Volkswagens and 2 seater sports cars, right at the perfect time for muscle cars and with all the help I could have wanted, I messed up badly. But they did help me with my little cars. When I was 16 and dropping hints to my Dad about buying me a car he said that if I could get that old Chevrolet in the driveway running then I could have it. Otherwise I could walk. That was in 1969. I started learning about engines real quick. Got the 327 running pretty soon. Rebuilt the engine, changed the rear out to 4.11 posi and bought extra powerglide transmissions. Top speed was around 80MPH. Felt like I was towing a dump truck. Needed room for the bigger tires so I went to the premiere suspension shop in town and they installed '409' springs all the way around. Lifted the car around 3 inches and rode like it was built that way. I didn't recognize it as my car when I went to pick it up. After a lot of tinkering someone liked it as much as I did and carried it with them. It was found by a county sheriff while he was hunting about 6 months later. He said he didn't know how they got it in there unless they dropped it from a helicopter. It was very similar to the one pictured below.